We’d love your help. 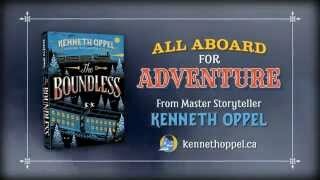 Let us know what’s wrong with this preview of The Boundless by Kenneth Oppel. The Boundless train is on its maiden voyage across the country. When first-class passenger Will Everett gets the key to a train car containing priceless treasures, he becomes the target of sinister figures from his past. To survive, Will joins a travelling circus, helped by ringmaster leader Mr. Dorian, and Maren, a girl his age and an expert escape artist. To ask other readers questions about The Boundless, please sign up. This book kept me interested the whole time because it was full of mysteries. I really love this book, but I wonder who is going to read and discover the fascinating book next? Cleverly told and kept me interested the whole time. I handed it right to my 12 year old son, who has a Big Foot obsession. BOOKTUBEATHON BOOK #5 DONE BLESS UP. I enjoyed this a lot! It was more exciting than I thought it would be. I loved the story, but the characters didn't have a lot of growth, or at least growth that made sense. It was mostly all about the plot, which in this case was good, so not a total loss! I loved the descriptions of the cars on the boundless because that seriously sounds like a train I want to be on. Overall enjoyable though not incredible! A truly great book that kept me up - reading - all in just one evening. An evening that flew by and very little laundry was folded and put away. This isn't the first Kenneth Oppel book that I've read (or read aloud to my kids) that made me think it would make a fantastic movie. We loved it. I'm always on the edge of my seat when I read that he'll publish something new but I almost felt like I'd won the lottery when I saw the blog post where he mentioned all of the research for this book. It's li A truly great book that kept me up - reading - all in just one evening. An evening that flew by and very little laundry was folded and put away. This isn't the first Kenneth Oppel book that I've read (or read aloud to my kids) that made me think it would make a fantastic movie. We loved it. I'm always on the edge of my seat when I read that he'll publish something new but I almost felt like I'd won the lottery when I saw the blog post where he mentioned all of the research for this book. It's like a gift to parents when a popular author ties his suspenseful story telling to things that actually happened in our country's history (I know that some parts were fictional; but not the sasquatches, right?) I couldn't stop talking about this book when I had finished it but my kids just grabbed it right up when they saw the name on the front cover and stopped listening to my enthusiasms. There really is something a bit magical about his writing. The sentences all seem to knit together in your mind and make the scenes come alive on an internal movie screen. We had a lot of fun talking about train that the novel is named after; would it actually be possible to have a steam engine that was several kilometres long? Would people choose to travel on it the same way they did in this book? Would Will Evrett's father really have risen so quickly in the railway organization? Some of the technical discussions we had about the train related to the way Oppel described the flying ships in the Airborn or the libraries of the mansion in Such Wicked Intent... and then we also started thinking about the trains that Katniss and Peeta travel on. We did agree it was a book for middle-grade kids and not an easy sell to teens, however some super fans will love reading it anyway. No risk here. Sasquatches and a windigo! Come on, it's Canadiana at it's very best. I really, really wanted to enjoy this book. It had trains, which I love, it took place in an alternate Victorian era, and it was an adventure. But alas I could not get past two very big things, the first it being so incredibly boring and slow. It took at least 200 pages to get going and it takes place on a train which you'd think would go by even quicker, but no. There's also a hint of romance in this which I wasn't for, you all know how I feel about MG books with romance in them. I don't 1 STAR! I really, really wanted to enjoy this book. It had trains, which I love, it took place in an alternate Victorian era, and it was an adventure. But alas I could not get past two very big things, the first it being so incredibly boring and slow. It took at least 200 pages to get going and it takes place on a train which you'd think would go by even quicker, but no. There's also a hint of romance in this which I wasn't for, you all know how I feel about MG books with romance in them. I don't like it. This could've been a favorite of mine, and that cover!! it's gorgeous but it just didn't work out for me. NOW! let's get to the second and most important to me, the usage of Blackface/Brownface as a disguise. I won't spoil it too much but Blackface/Brownface is used on the main character in this book and how the author didn't see that that was a gigantic no-no is beyond me. And what bothers me even more is that other reviews on Goodreads haven't mentioned this. Lately I've been seeing a discussion going around on Twitter about authors who write historical fiction disregarding diversity because of the time period they write in and I think it's a load of bull. It's historical FICTION for a reason, you can do whatever you want with it. So using the time periods as an excuse needs to stop. And I feel like that is the argument that would be used in this book's case. But as I said above, this takes place in an alternate Victorian era, again ALTERNATE so this is the author's own creation of the Victorian era we are reading and maybe the usage of Blackface/Brownface was unintentional, but still, it doesn't mean it isn't WRONG. Actually more like 3.5 stars. I found this entertaining, particularly as I got towards the end, but I'm not the target audience for this book and I think it showed. If I'd read this as a child I think I would have loved it though. Our main protagonist is Will Everett, whose father works on the railroads and, following an accident three years earlier in which he saved his boss's life, has been promoted through the ranks to rise to the top of the company. The Boundless is the longest train ever buil Actually more like 3.5 stars. The Boundless is the longest train ever built, and it is on it's maiden voyage. Will is accompanying his father on this trip, along with a circus troop, and the funeral car carrying the body of Cornelius Van Horne, aforementioned boss. Will finds himself caught up in all sorts of adventures, and I think that any middle-grader would really enjoy this. The story moves along at a cracking pace, and Will himself is an extremely likeable main character. He is well fleshed out and easy to identify with. The other characters in the book are also quite well drawn. A long time ago, when I was a lot younger, I loved books like this, and as I was reading this, it did spark some fond memories for me. God, I'm such a sucker for a book with a beautiful cover. 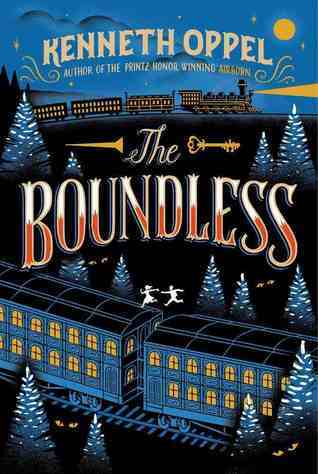 And my God, the cover of The Boundless is stunning. I really wish that the story was at least half as beautiful or stunning as the cover is. I wish that I would've found The Boundless even slightly interesting. But alas, it was not meant to be. Here's my issue with The Boundless...it was boring. I'm talking coma-inducing boring. The beginning was meh, so I thought "Let me give it at least until the middle. I'm sure it'll pick up by then". God, I'm such a sucker for a book with a beautiful cover. And my God, the cover of The Boundless is stunning. I really wish that the story was at least half as beautiful or stunning as the cover is. I wish that I would've found The Boundless even slightly interesting. But alas, it was not meant to be. Here's my issue with The Boundless...it was boring. I'm talking coma-inducing boring. The beginning was meh, so I thought "Let me give it at least until the middle. I'm sure it'll pick up by then". But it didn't. And once I reached the end, I thought "good riddance". The Boundless is pretty much bland characters doing bland things that are masquerading as adventurous...only it wasn't. Not even a little bit. Another thing that annoyed me about The Boundless was Will's characterization. This is someone who is about 17. Yet his actions and his thoughts are those of a little kid, not an almost adult. It seems as though the author dumbed him down to justify an older teenager being a protagonist of what is essentially a children's novel instead of just having it be YA. I was privileged to attend a Kenneth Oppel launch of this book and hear a lot about the genesis of this idea. He's taken an interesting approach with this book. By mythologizing Canadian history, he takes us on a journey across Canada, from Halifax to Victoria, via a Titanic-inspired train that is populated with famous personalities such as Sam Steele and creatures such as a Sasquatch. Personally, I enjoyed the use of present tense, which really serves to ground the reader in the moment (an inte I was privileged to attend a Kenneth Oppel launch of this book and hear a lot about the genesis of this idea. He's taken an interesting approach with this book. By mythologizing Canadian history, he takes us on a journey across Canada, from Halifax to Victoria, via a Titanic-inspired train that is populated with famous personalities such as Sam Steele and creatures such as a Sasquatch. Personally, I enjoyed the use of present tense, which really serves to ground the reader in the moment (an interesting tactic for a book that takes place in the past). A cross-continental Canadian steampunk circus train con job adventure, plus sasquatch to boot. 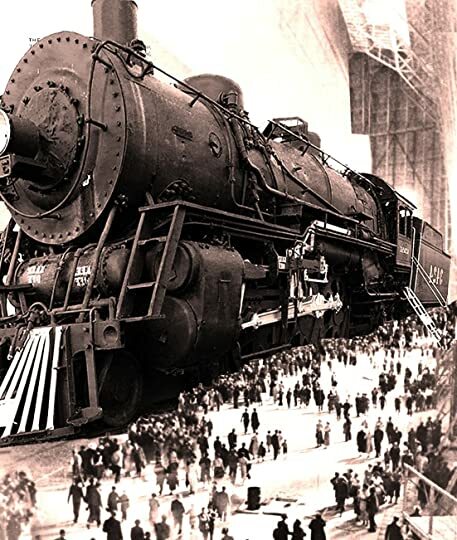 Through a classic rags-to-riches turn of events our young man Will Everett finds himself traveling first class on The Boundless, the largest steam engine train ever built, for its maiden transcontinental voyage. However, when Will witnesses a murder and becomes a target himself, he must literally join the circus on-board the immense train in order to save himself, his friend the mysterious escape artist Maren, his father the railroad magnate and head engineer, and possibly the entire train. Like many Americans, I know perilously little about Canadian history and geography. The Boundless is an unapologetically Canadian book, and it’s all the better for it, but it is also a book that plays fast and loose with reality. Sasquatches and other mythical creatures are accounted as real, so being an ignorant American it is hard to know just where the historical realities end and the fantasies begin. Poking around on the Internet after finishing this book I was almost surprised to find that William Cornelius Van Horne was in fact a real railroad president who actually did manage the colossal construction of a transcontinental Canadian Pacific Railroad. But was his body actually interred in an electrified railcar tomb filled with treasure? Did the mighty Boundless engine actually exist and pull 900-plus cars in one cross-country trip? Who knows? Who cares? This is just a fun adventure and its historical Canadian setting only makes it all the more fantastic for American readers, while giving Canadian readers a great national children’s novel to get behind. Content note: this book portrays violence, some minor swearing of the damn and hell variety from the bad guys, brandy-clinking and cigar-smoking Robber Barrons with impeccable facial hair, a creepy animatronic severed hand, scenes of sustained tightrope walking, and more. This is not a book I would have picked up on my own (it was given to me to review). So I was pleasantly surprised at how much I liked it once I got into it. For this reason, five stars! I feel kind of guilty for not loving this book more, because there is really nothing technically wrong with it -- at least not that jumped out at me while I was reading it. But for some reason I just didn't love the characters or the story enough to get excited. Pity, because there are a lot of great ideas here -- but for whatever reason, I was just not the right reader for this particular story. That wouldn't keep me from recommending this book to others who might find it more to their interest I feel kind of guilty for not loving this book more, because there is really nothing technically wrong with it -- at least not that jumped out at me while I was reading it. But for some reason I just didn't love the characters or the story enough to get excited. Pity, because there are a lot of great ideas here -- but for whatever reason, I was just not the right reader for this particular story. This book is too amazing to write about. Highly recommended!! This book was hecka dope!! My friend recommended it for book club and I'm so glad she did!! This book has action that's perfectly paced throughout the book. The events of the first chapter really just grab you and take you along for the ride! I DEFINITELY recommend reading this book!! You certainly won't regret it!! This is the first book I've read from Kenneth Oppel since several years ago (I read Silverwing, Sunwing, and Firewing)... and I enjoyed it. Despite my agitations, I love Mr Oppel's writing, the way he makes characters come alive, and mostly, I love his imagination. I am officially a Kenneth Oppel fan. If you like younger feeling YA and middle grade, he is a sure bet. Also, if you're Canadian, most of his books will give you at least a small amount of patriotic affection for them. If you're not Canadian, you probably won't notice, so don't be afraid! It's like little Canadian easter eggs. Kenneth Oppel is so good at fun allusion - which is exactly why I think adult can appreciate his novels just as much as a 12 year old. In this book we have nods to The Pic I am officially a Kenneth Oppel fan. If you like younger feeling YA and middle grade, he is a sure bet. Also, if you're Canadian, most of his books will give you at least a small amount of patriotic affection for them. If you're not Canadian, you probably won't notice, so don't be afraid! It's like little Canadian easter eggs. Kenneth Oppel is so good at fun allusion - which is exactly why I think adult can appreciate his novels just as much as a 12 year old. In this book we have nods to The Picture of Dorian Grey. The Boundless takes place aboard a train that's eleven kilometres long and has over 900 cars. It houses everything from diplomats to 80 cars of, what else? A circus! We get to see Sasquatch and Bog Hags, experience reliving The Last Spike, and spend the book being hunted by evil brakemen while being accused of murder. 2.5 rounded up. A fun YA adventure, but having it from Will's POV negated any awesomeness the single (1! No other females were main or secondary characters, nor did any have more than a bit part in small scenes) female character may have had. It's a good yarn for the age group it's aimed at. The train's pretty cool too, though I could only think of Snowpiercer (graphic novel turned film with the same premise, but dystopian/post-apocalyptic) as I read the descriptions of the various cars and clas 2.5 rounded up. A fun YA adventure, but having it from Will's POV negated any awesomeness the single (1! No other females were main or secondary characters, nor did any have more than a bit part in small scenes) female character may have had. It's a good yarn for the age group it's aimed at. I really liked this book! What an exciting read! Nonstop action almost from beginning to end featuring avalanches, sasquatches, murder, gigantic people and trains! I think kids would like it... will test it on a few to find out! The setting was super fun! Unfortunately that doesn’t matter a whole lot when the plot, characters, and prose all fail to deliver. Plus it had a few swear words (in middle grade? REALLY?) so I wouldn’t recommend it. Thoughts on the Overall Book: Typical of Kenneth Oppel, this is a classic adventure novel with a flair of steampunk and the fantastical. I have never read one of his books that I didn't like! Characters: Will Everett was a very enjoyable character to read about. I really liked him because, unlike a lot of characters in middle-grade adventure novels, he is Thoughts on the Overall Book: Typical of Kenneth Oppel, this is a classic adventure novel with a flair of steampunk and the fantastical. I have never read one of his books that I didn't like! Characters: Will Everett was a very enjoyable character to read about. I really liked him because, unlike a lot of characters in middle-grade adventure novels, he is rather shy and quiet, and quite a bit of an introvert. But watching him grow in confidence was nice to see, and I think creating a character like that is good for kids who are the same way. He was very brave and loyal and had a good sense of what was right and wrong. I also liked Maren a lot. She kind of reminds me of Kenneth Oppel's usual heroines, but I have always liked them, so I had no problem with that. She's the outgoing one, and she knows how to get a job done, and is quite capable of doing it, but she never has an attitude and when Will has to help her, she doesn't get angry about it, but accepts it as something that needs to be done. Mr. Dorian was also a very interesting character. I won't say too much about him because I don't want to spoil the story, but I did like him despite his faults. And needless to say I LOVED the circus performers. Give me a troupe of players and I'm happy. Brogan wasn't the best villain I have ever read, he was just kind of ordinary, but in this kind of book and being MG, he worked perfectly fine. The Romance: No romance, it is a MG book, but there is, of course, a hint that perhaps in later years Will and Maren's friendship will grow into romance. Writing Style: This book was actually a bit different in styles from Kenneth Oppel's usual writing. It's third person and present tense. I'll admit, I didn't think it flowed as well as his usual first person past tense narration, but it wasn't terrible either. It took me a little to get used to it, but it wasn't as choppy as some I have read. Because of it, I think this book just slightly lacked a little of the voice that his others, like Airborn did, but it was still awesome, and the descriptions were just as vivid and wonderful as usual. This book literally had everything I love in an adventure novel: trains, secret compartments with booby traps, traveling players, and a fine young hero. And hey, it also has sasquashes . How on earth can someone not like this book? It's like Jules Verne meets Indiana Jones. Accuracy/ Believability: Not really applicable, the point of this book is that it's fantastical, but I love the idea of the Boundless and I think it would be totally awesome and could have happened. Problems/What bothered me: Nothing, I loved it! Conclusion: 5 stars. Just another awesome book by one of my favorite authors. This one ended great, but I wouldn't mind seeing more in the same world. Recommended Audience: If you have not read one of Kenneth Oppel's books yet, what are you waiting for? If you haven't, and you liked books like Jules Verne, than this is one author you need to try. This would make a great guy read, as well as girl read, ages 12 and up. Let me just preface this review by saying I am a huge Kenneth Oppel fan and absolutely LOVED his Silverwing and Airborn trilogies. The root problem of this book is the setting/setup. It's way too similar to Skybreaker: there's a special key, the unique train is basically the equivalent of the Hyperion, the sealed funeral car is also the equivalent to Theodore Grunel's airship, the main plot also involves a treasure hunt, the bad guys want the treasure, while Maren and Will are just Naira and Mat Let me just preface this review by saying I am a huge Kenneth Oppel fan and absolutely LOVED his Silverwing and Airborn trilogies. The root problem of this book is the setting/setup. It's way too similar to Skybreaker: there's a special key, the unique train is basically the equivalent of the Hyperion, the sealed funeral car is also the equivalent to Theodore Grunel's airship, the main plot also involves a treasure hunt, the bad guys want the treasure, while Maren and Will are just Naira and Matt reborn. Oppel basically recycled his own plot and characters from Skybreaker and substituted a train for an airship. Despite this redundancy in recycled material and using the same story formula, this book wasn't even as good as Skybreaker, a superior and more advanced read. The story in The Boundless is entirely restricted to the setting of the train, and trains as we all know are long and straight, with only ONE path to follow. The plot reflects this by also being less than complex when the only action is waiting for Matt (oops I mean Will) to get from Point A to Point B (the back of the train to the front). YAWN. I mean, the story became predictable and boring as I just read about Will making his way slowly to the front of the train. There was nowhere else for him to go, which meant the plot had nowhere else to go either. Lastly, the sasquatches were completely pointless and irrelevant. They weren't like the cloud cats in Airborn which were actually an interesting and necessary part of the story. Cloud cats are also 10x more interesting to read about because Oppel INVENTED them, as opposed to sasquatches which are boring and everyone already knows about. Again, we hardly get to read about them anyway. *Trains! From The Lady Vanishes to Murder on the Orient Express I've always loved mysteries and thrillers that take place on trains. And The Boundless is quite the train - there's a swimming pool on this puppy! *The Circus. I always enjoy books where circus performers make an appearance, and this book is no exception - Maren and the rest of the Zirkus Dante crew are great - I just wish I could have seen more of them! *Moral Ambiguity. The characters are more nuanced than usual for this age group. Thieves can be sympathetic, and even thugs and murderers make some good points. It's a good, solid work. I'd like to see some sequels, but it does stand quite well on its own. Imagine going on a train and enjoying your voyage until you witness something, a murder. A whole new terrifying adventure and thrill begins right at that precise moment. For Will Everett this is simply his life and he must go on a exciting yet dangerous journey across the long train, The Boundless. Will must get back to his father, but will he? I picked up this book because it's book trailer looked really cool.Plus, at the red maple meeting, many liked this book so I thought why not read it? I b Imagine going on a train and enjoying your voyage until you witness something, a murder. A whole new terrifying adventure and thrill begins right at that precise moment. For Will Everett this is simply his life and he must go on a exciting yet dangerous journey across the long train, The Boundless. Will must get back to his father, but will he? I picked up this book because it's book trailer looked really cool.Plus, at the red maple meeting, many liked this book so I thought why not read it? I began reading it and I immediately loved the story. Adventure,intensity and history all in one book? I didn't think it was possible till I read The Boundless! I continued reading this book and finished it because there was so much thrill that I couldn't stop reading! I just kept on reading and soon finished the book. I simply loved how there were twists and how the book was sometimes unpredictable. Vrlo zabavna knjižica smeštena u neki alternativni 18/19 vek. Iako imamo ljudskog heroja kojeg pratimo kroz veći deo knjige po meni glavni junak je sam voz gde se skoro čitava radnja priče i dešava. Priča je interesantna samo dosta sporovozna :) Ako imate strpljenja za sporije knjige ovo je ondak odlično štivo. This would garner 3.75 if I could rate books that way. Solidly written and entertaining, this is historical fiction/fantasy. Adults who have read Oscar Wilde or are familiar with P.T. Barnum's sideshow acts will get some references here that kids will not, but they're not crucial to the plot. Richly described and wildly exciting, this is a fantabulous train adventure story! Just like the 400 car train-ride of the Boundless, this book is a rush of adrenaline. A swooping plot! The story tells of Will, the artistically inclined son of a railway tycoon, who, after witnessing a murder, must do everything to get to the front of the train to warn his father, and stop the murderer. Along the way, he joins up with Mr. Dorian (a French-Native American descent) circus ringmaster and an intriguing escape artist, Maren, who may have an agenda of their own. The book addresses is Just like the 400 car train-ride of the Boundless, this book is a rush of adrenaline. A swooping plot! The book addresses issues of classism, racism, sexism, death and includes elements of mythology. The book is equally descriptive of its environment as much of the passengers/inhabitants of the train. This book went on my favorite's list. I may actually BUY this one! I also listened to the audio book version and the narration by Nick Podehl (who does narrate a lot of YA and Juvenile Audio) does an amazing job. The book keeps you going to the last page and this is one train ride you DON'T want to end! If parents want to read a book while your kid is reading this, even if you don't read it yourself, Water for Elephants, Murder on the Orient Express, Big Fish...would be good companions for this book!